The Volare Mag Speed trainer uses a magnetic resistance unit to provide 5 levels of pre-set resistance to your back wheel as you workout. The resistance is controlled via a handlebar mounted resistance dial, meaning you can modify how stiff your ride is without leaving your bike. 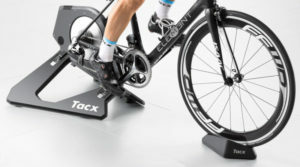 The trainer comes fully assembled meaning you can start working out straight away when you get the turbo trainer out if its box. The resistance unit itself is spring loaded so that it pushes up against your bike tyre to ensure a consistent and correct pressure, and the whole trainer folds for easy storage and transport. This is a low prices trainer in Elites range. The trainer is compatible with Elite app that displays output metrics such as heart rate, cadence etc, although extra sensors may need to be purchased in addition to downloading the app. Also, the elastogel roller (where your back tyre spins against) improves tyre grip, reduces tyre wear & vibration, and also provides 20% less noise over normal trainer rollers. "Good trainer for beginners." "Recommended it by a mate and I haven't been disappointed." "Noise levels are minimal and the build quality is excellent." "A simple no nonsense trainer." 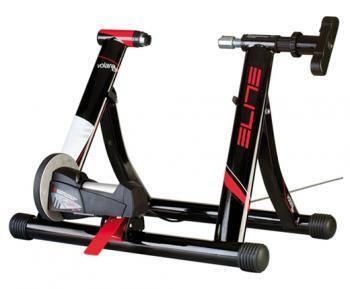 "This is a great entry level turbo trainer."